If your business is looking for ways to reduce the environmental impact of its operations, your packaging is a great place to start. Sustainable packaging solutions can be divided into three categories – those that help limit the amount of packaging waste, those that can be reused, keeping them in circulation for longer and those that can be recycled and turned into a new product. We take a look at each category by reviewing specific examples. Switching to a lower micron stretch wrap is a great way to reduce your stretch film usage. A 12 micron high performance machine film, for example, helps maximise load containment without compromising cargo stability. Automated stretch machines help ensure you only use as much film as necessary, keeping packaging waste to a minimum. All this helps reduce your material costs (as you will need less film to secure each pallet) while increasing your green credentials and improving efficiently of your entire operation. For more information, read our article – Automation to help you use less packaging material. They might be made of plastic, but they really are a reliable, reusable and long-lasting alternative to their wooden counterparts. They are easy to clean and splinter-free, making them simple to handle and maintain. They are also lightweight and stackable, which helps reduce transport costs and maximise storage space. Plastic pallets are a good example of plastic packaging that can benefit the environment thanks to its durability and reusability. Have you heard about cardboard shredders? They are automated machines designed to turn everyday cardboard into void fill strips or protective matting. This is a great idea to recycle and reuse your corrugate waste and a perfect eco-friendly alternative to packing chips and bubble wrap. The produced material offers a good transit protection, preventing product damage on the way to customers. 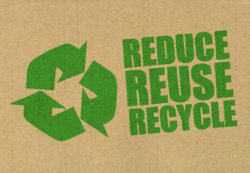 It also helps show customers you care for the environment, as cardboard recycling saves trees, reduces waste and energy involved in producing new items. At Macfarlane Packaging, we can work with your business to help find the most-optimised, eco-friendly packaging solutions that meet your requirements and your budget.